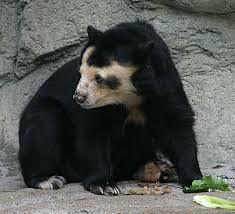 You can recognize the Andean bear by its yellowy-white mask that surrounds the eyes like glasses. Apart from that they are black. The highly endangered bears are now the only big bears left in South-America. They are living in different areas and are able to adapt well to their environment. The females are quite smaller than the males. Andean bears can reach a shoulder-height of 70-90cm and the body is 1,30 –2,10m. To get their food (they are polyphagies, but are mainly feeding on plants and fruit) they also climb trees, and often they are even building their sleeping accommodation on trees as well.